Stop signs are everywhere. But one place we don't need them is in the classroom, or anywhere else where learning and sharing might take place. And by holding up "stop signs", I mean bullying! Bullying is still a problem that exists today. In fact, "It is estimated that 160,000 children miss school every day due to fear of attack or intimidation by other students. Source: National Education Association." And according to Facts & Statistics, the numbers continue to rise every month. One form of bullying is holding up "stop signs". 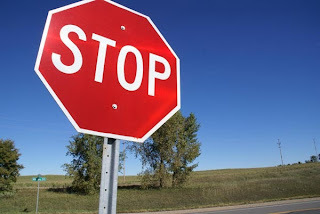 Holding up "stop signs" is equivalent to "teasing". Teasing is one of the most common forms of bullying, whether it's in person, or online. Gordon MacKenzi, author of the book, Orbiting the Giant Hairball, even describes teasing as the “Death of a thousand Cuts". In his book, Gordon describes a time when he witnessed a teasing incident while he was leading a creativity workshop for adults. Because when you finally stop living, you will no longer be a threat to me. None of us deserves stop signs like that. So I would ask you--those of you who are inclined to tease others--the next time you are about to tease someone, pause for just a moment. Look deep inside yourself. See if you can get in touch with your motivation. And, perhaps, reconsider. If you were Gordon, how might you have handled this situation? How should we as educators handle these types of situations in our classrooms? Or when we are holding online discussions? What are some ways that we can create a safe learning environment to prevent these incidents from occurring? How might we be more proactive, rather than reactive in these situations? Let's put down the stop signs and continue to encourage creative risk-taking with our students and provide safe learning environments for them to take these risks! MacKenzie, G. (1998). Orbiting the giant hairball: a corporate fool's guide to surviving with grace. New York: Viking.